Here’s my quick Friday Five. The Champion by Carrie Underwood, featuring Ludacris. I discovered this song last year, loved it, but haven’t played it for a long time. I haven’t played any music for a long time, to be honest. All of the time I once filled with music I now fill with podcasts or audio books. This week I spent some time listening to this song again and vowed to make music more a part of my life. Dress code – and in particular, how you should dress in a professional work setting when meeting a client for the first time. I’m doing a run of home visits at the moment, which aren’t super common for me. I’ll volunteer one where I think it’s needed, and if someone requests it I’m happy to accommodate it if I can. In my experience, the people requesting home visits often tend to be vulnerable in some way. Maybe because of age, or disability – but it’s never really a case that the person considers themselves to be so busy or important that they can’t come to me. The rule I’ve come up with is that my dress should be suitable for the occasion, but also be focused on putting the other person at ease. If a client’s requested a home visit because they are so ill or anxious that they can’t come to my law firm’s offices, they perhaps wouldn’t appreciate me turning up at their home in an extravagant designer suit. I’ve been opting for a smart blouse and jeans, and for telling clients up front that I’ll dress casual and want them to do the same – that way they know that there’s no chance of us turning up at court dressed that way. How programmed am I to respond to advertising? I might have said not very but while I’ve been typing this, I paused to check my eMails. Who am I to argue with Susan Cain? I opened the eMail, saw the cover of the book in question, went over to the Amazon app and added it to my wish list. Without even reading the blurb! Now, I’m a fan of Susan Cain (author of the life-changing book Quiet – and not much else. Come on Susan, hurry up and write more!) so it isn’t that I react the same way to any suggestion that I should buy something. A slightly scary reminder of the power of marketing. The book? 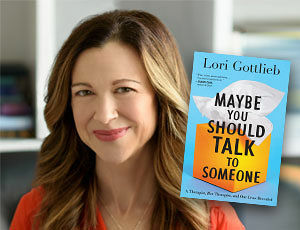 Maybe You Should Talk To Someone by Lori Gottlieb. It’s a promise to myself, and it’s the promise not to buy any new books until I’ve finished my to read pile, which is mainly non-fiction. Ugh. I just can’t keep this promise and I’m not even too sorry for it. In fact, my reading pile was next to my bed for weeks and it was almost as high as the windowsill… but I kept buying new books to add to the pile and it was getting a little unsteady, so I’ve hidden it away in the back of my wardrobe now! I want to read all of the books in that pile, and I’m sure I will, I just keep hearing recommendations (like the one above) or I get to the end of a book and I feel like reading fiction so I order a new novel. I have the book sickness, I guess.